I’ve been conducting a lot of interviews recently and I thought I’d share my format for asking questions and stemming conversations that works well for me to be able to determine if the candidate is the right person for the job when it comes to skills, experience, mindset and remaining relevant in the industry. (Start at the top right with “intro” and read clockwise). Sometimes, depending on the candidate, I might ask them to test a fictional requirement at the end too, such as a chair, a blank sheet of paper or a mug… I’ll always have a different purpose for each item than the standard use for it (e.g. the chair might be a doll house chair, the paper might be sugar paper and the mug might be to store pens on my desk, etc). It’s important to remember that all of these questions are just the basis for conversations, and context is key in the conversations too! And there are no set rules, You don’t have to ask all of these questions, or ask them in any set order. The one thing I do suggest you do though, is if you get the strong impression that you aren’t going to employ the person within the first 5 minutes of speaking to them, then it would work wonders for them and yourself if you start to talk to them about some of the misconceptions and teach them about testing. Help them get better. Or at the very least, supply them with some useful blog names for them to look at and enhance their skills to become a better tester. Like my blog? Share it! Next postNew to software testing? Want to learn more about your craft? Come and join us at the Software Testing Clinic!! What a load of previous nonesense. Are you American par chance?! I’m not American. What made you think I was? I’d love to hear why you think my post is “previous nonesense”. Care to share your experience? Nice post. Similar to my approach however i have a node or two relating to Technical Skills aswell. Is this something you ask aswell? I usually incorporate “technical” skills questions into the “testing knowledge” section, where I’ll ask about lateral and critical thinking skills, and technical skills surrounding investigation. If the role requires automation skills, then I’ll dive into the coding skills questions hen I ask about what’s possible and not possible with automation. But the level of questioning on any of these things also depends on the level of the role (Junior, Senior, etc) that I’m looking to hire for. Dan – brilliant mind map! I can see these ideas being very useful for interviewing for a role that requires testing experience, most likely *as* a tester. Do you apply the same interviewing framework for entry-level testers? I ask because when I took my first testing job (a salaried position in a big agile shop that valued ET methods for testing consumer software), I knew *nothing* at all about the depth of the testing discipline. I knew nothing about testing methods, the breadth of discourse available online, and the varied testing perspectives and their points of tension. What does the mindmap look like when assessing someone’s potential to be a tester versus assessing how deep someone is in already? Hi Rachael! Thanks for your comment! So I generally use these questions to stem discussions. The discussions will give me more depth of the candidates skills, experience, mindset and personality. I use the questions for people at any level. I’ve interviewed people with 2 years experience that have gotten involved in the testing community and are aware of the misconceptions within our industry, and I’ve interviewed people with 10+ years experience that have only worked for 1 company over 10 years, and have never learned about their craft so might have some of the misconceptions. So I don’t really see a distinction between having X years of experience, but more in a distinction in levels of knowledge, skills, experience, mindsets, etc… These questions help stem the conversations that will allow me to determine these levels for the candidate. And if someone doesn’t know terminology, that doesn’t matter. If someone has a misconception but is willing to learn, or if someone isn’t involved in the testing community and self learning, maybe because they didn’t know about the community, but they show that they are keen, then thats all positive. Context is very important. Thanks for the comment Geekboopathi! These are nice topics to discuss – but what it says of the nominee? So if one has misconceptions – couldn’t we easily fix that after we recruit him/her? 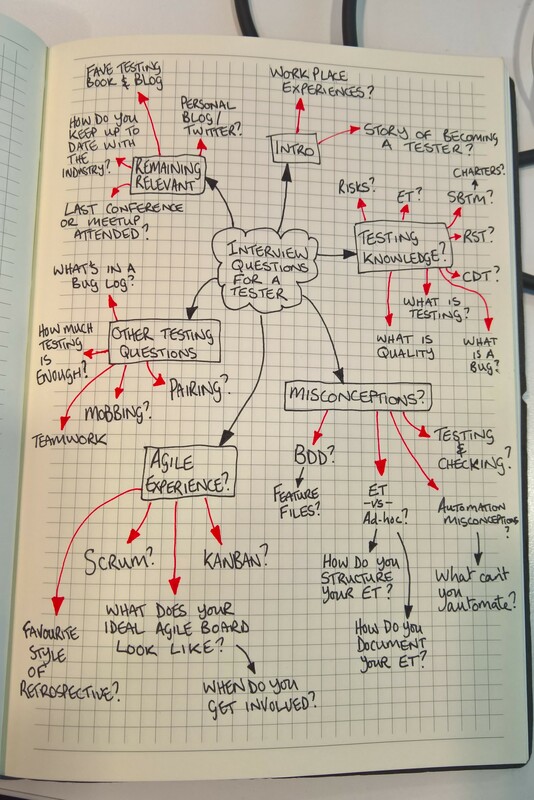 If that person has not evolved yet to read blogs and tweets – is he a bad tester? It all refers to current knowledge – rather than potential. Hi Kobi! How are you? But yes… The questions are essentially heuristics to stem discussions. the conversations allow us to determine the candidates levels of knowledge, skills, experiences, mindsets, drive for learning, etc. All this information that we obtain through the conversations will allow us to determine whether they are suitable (within the context of the role available). My interview happened more like this. Good one Dan! Dan, how do you interview for “Get the job done” skills? Where do you fit in questions about team / personality conflict and communication styles? Or do you mainly try to get that implicitly from the interview? Nice work – I’ll use the mug example later today!